Ernst Haeckel was an eminent German biologist, naturalist and artist who discovered, described and named thousands of new species, mapped a genealogical tree relating all life forms, and coined many terms in biology, including phylum, phylogeny and ecology. Haeckel promoted and popularized Charles Darwin’s work in Germany and developed the controversial recapitulation theory claiming that an individual organism’s biological development parallels and summarizes its species’ entire evolutionary development. The published artwork of Haeckel includes over 100 detailed, multi color illustrations of animals and sea creatures. Haeckel studied under Carl Gegenbaur at the University of Jena for three years, earning a doctorate in zoology before becoming a professor of comparative anatomy at the University of Jena. 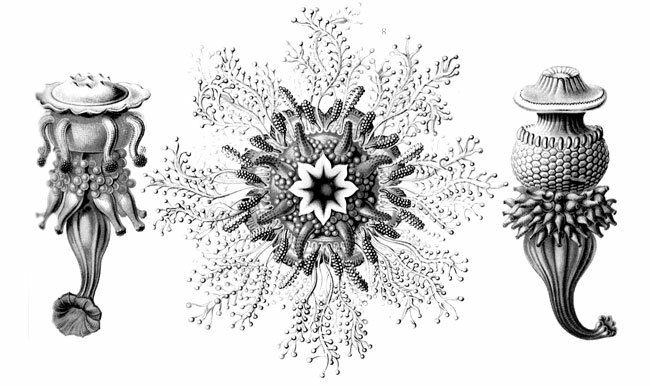 Between 1859 and 1866, Haeckel worked on many invertebrate groups, including radiolarians, sponges and annelids. During a trip to the Mediterranean, Haeckel named nearly 150 new species of radiolarians. Haeckel was a zoologist, an accomplished artist and illustrator, and later a professor of comparative anatomy. Although Haeckel’s ideas are important to the history of evolutionary theory, many speculative concepts that he championed are now considered incorrect. For example, Haeckel described and named hypothetical ancestral microorganisms that have never been found. He was one of the first to consider psychology as a branch of physiology. His chief interests lay in evolution and life development processes in general, including development of nonrandom form, which culminated in the beautifully illustrated Art Forms Of Nature. Haeckel did not support natural selection, rather believing in the inheritance of acquired characteristics. Haeckel advanced the recapitulation theory which proposed a link between development of form and evolutionary descent. His concept of recapitulation has been disputed in the form he gave it, now called strong recapitulation. Strong recapitulation hypothesis views ontogeny as repeating forms of the ancestors, while weak recapitulation means that what is repeated and built upon is the ancestral embryonic development process. He supported the theory with embryo drawings that have since been shown to be oversimplified and in part inaccurate, and the theory is now considered an oversimplification of quite complicated relationships. Haeckel introduced the concept of heterochrony, which is the change in timing of embryonic development over the course of evolution. Haeckel’s entire literary output was extensive, working as a professor for 47 years, and even at the time of the celebration of his 60th birthday at Jena in 1894, Haeckel had produced 42 works with nearly 13,000 pages, besides numerous scientific memoirs and illustrations.